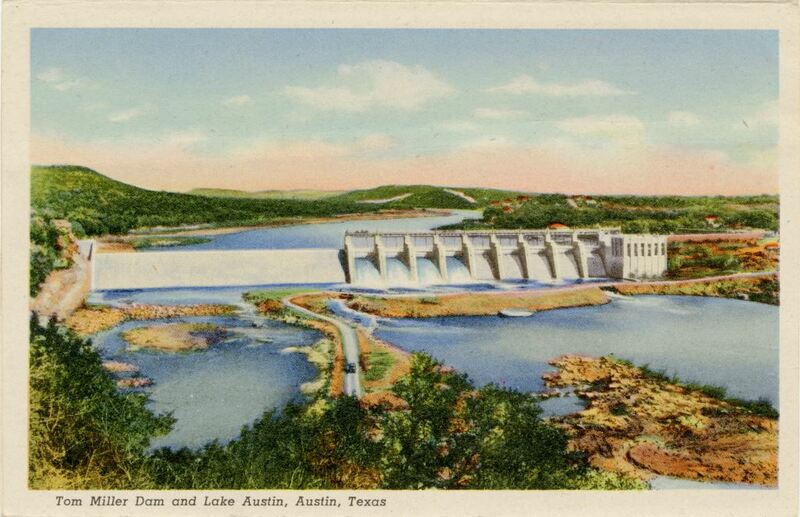 A postcard depicting the Tom Miller Dam and Lake Austin in Austin, Texas. 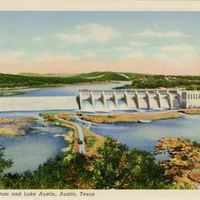 Named in honor of Austin mayor Robert Thomas Miller (1893-1962), the Tom Miller Dam began operation in 1940 and forms Lake Austin, formerly known as Lake McDonald. "Tom Miller Dam and Lake Austin." LCRA. http://www.lcra.org/water/dams-and-lakes/pages/miller-dam.aspx. “Tom Miller Dam and Lake Austin Postcard.” RICHES of Central Florida accessed April 22, 2019, https://richesmi.cah.ucf.edu/omeka/items/show/6676.